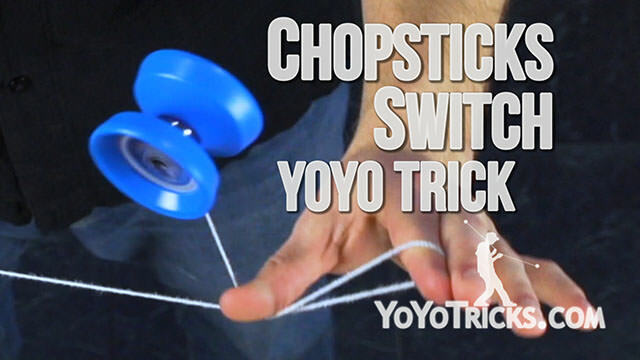 Learn how to do the 1A Yoyo Trick known as Chop Suey, a simple, fun repeater trick with chopsticks elements that is great for practicing flow. 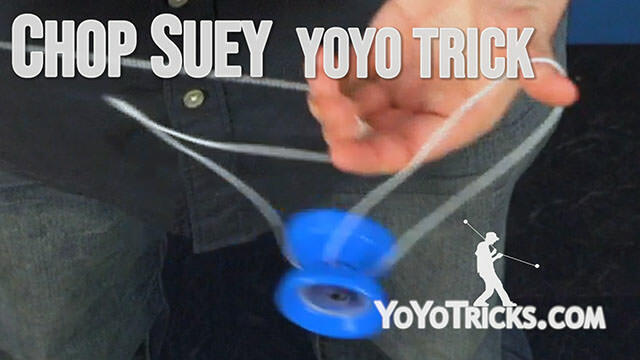 Chop Suey Yoyo TrickIn this video I am going to teach you the Chopstick Repeater trick known as Chop Suey, and it looks like this. Now, there are no tricks that you need to know in order to learn Chop Suey, but we do recommend that you know the trick Chopsticks Switch, it will make it easier to understand and learn this trick. Chop Suey starts in a Trapeze. 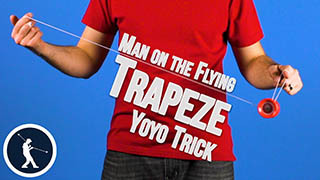 Then, you are going to insert your thumb into the trapeze loop and spread your fingers wide. Now you are going to take your middle finger and curl it around the front of the string. Now, you are going to take your throwhand index finger and point it towards yourself. You are going to place it on top of the string in between your thumb and index finger. You are going to pull that string down and towards the throwhand side of your body. From here, you are going to hop the yoyo up, tilt your hands forward, and then land on this front string that is coming from your thumb. Notice that the loop of string that was around your non throwhand index finger is now on your non-throwhand middle finger. From here, you are going to drop the string that is around your throwhand index finger, leaving you in this mount right here. If you are having issues with the yoyo dropping off the string like this, you are probably pinching somewhere on your non throwhand that you should not be. So make sure to keep your grip on the string nice and loose. From here, you are going to turn your hand to where your thumb and index finger are now vertical. Then, you are going to swing the yoyo to the outside of your body, pulling back with your throwhand, allowing the yoyo pass in between your index finger and thumb. If you are having trouble with the yoyo hitting your hand and dying, then you need to try keeping your fingers spread wide open. That way, there is less in the way when the yoyo passes through for the yoyo to hit. You will also want to keep the string at the edge of your fingertips. 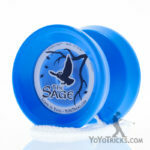 Another problem that you might run into is the yoyo missing to the front. All you need to do to correct this is move your throwhand forward. 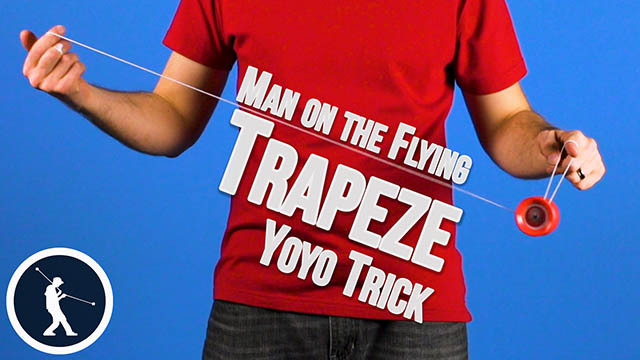 That way, the string is underneath where the yoyo is going to land, and you can land back in this trapeze. You will notice that you are back where you started, with a trapeze that has your thumb inserted. To repeat the trick, you curl your middle finger, pull the string, hop to the front, drop the string, and pass in between your fingers. Then you can repeat the trick as many times as desired. And that is how you do the trick known as Chop Suey.